Did you know that a study conducted a few years back revealed that most Americans consumed nearly 136 pounds of sugar each year? Compare that to the 4 pounds that our ancestors ate and you may start to question the effects this increased consumption on the health of Americans. Although not everyone claims to have a sweet tooth, most Americans inherently crave the sweet stuff. From birth, babies are fed breast milk and formula – both which are rich in sugar. Although breast milk does not contain table sugar that you would put on your food, the lactose it’s comprised of converts to sugar once it’s in the body. Glucose (sugar) can convert to energy that can be used by the body quickly. This energy can be used by every cell in the body – especially muscles and the brain. Interestingly, when consumed, sugar activates the brain’s reward system. Feel-good substances are released which can give people a rush and lead to addiction. Some people who naturally release fewer of the feel good substances such as dopamine and beta-endorphins, can be more highly addicted to the rush they feel when they consume sugar. Sugar has also been shown to ease the ability of tryptophan to enter the brain. Once in the brain, it converts to serotonin – a substance known for inducing calming seduction. At this point you are probably thinking that the increased consumption of sugar in our diets is a good thing. We start of with sugar from birth, it releases feel-good chemicals, and it can be used for quick energy. The problem, however, lies in the stress that it puts on the rest of our body. See, your body needs about 2 teaspoons (8 grams) of sugar running through the blood at all times. Did you know that 1 orange contains about 16 grams of sugar? That’s twice as much sugar than what your body allows in the blood. When sugar is ingested, your blood sugar skyrockets. Your pancreas responds by releasing insulin which pushes the sugar out of the blood and into the cells. When your blood sugar drops, so do energy levels. As a result, the adrenals pour out adrenaline which is a stress hormone that creates inflammation. The liver then responds to the increase in adrenaline by releasing stored sugars and the cycle continues. As you can see, this yo-yo effect creates stress on many organs. The stress and inflammation caused can be compared to getting tiny paper cuts on your cells. These wounds fester, and over time, lead to serious health complications. Type 2 diabetes is a deadly disease. If it continues to affect people at the rate it’s currently at, 1 in 3 people are expected to be present with it by 2050. 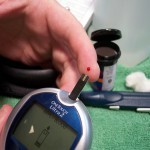 The disease starts when cells do not respond to the insulin released after blood sugar spikes. As the sugar is not able to leave the blood stream, inflammation increases which leads to heart disease, cancer, and other serious diseases. In fact, sugar is known to fuel cancer cells. To scan for cancerous cells, an individual is directed to consume a sugary drink. When the scan is conducted, the cancer cells light up because they have gobbled up large amounts of the sugar. The body-wide stress will also lead to a weak immune system. One condition called leaky gut may sometimes result. This is when food particles are able to pass through the digestive tract walls undigested. In response, the body fights off these food particles as if they were any other invader. This fatigues the immune system and allows for other stresses, like viruses, to overtake the body. Leaky gut is often the start to autoimmune diseases such as rheumatoid arthritis. What can we do as Americans to battle the over-consumption of sugar? Taming your sweet tooth will take some conscious effort, but it’s well worth it. It’s important to understand that some sugary foods and drinks are much less stressful for you body. For example, sugars found in fruits and even vegetables such as squash, are ingested with fiber which helps to slow down the release of the sugar into the blood. These foods also contribute other important macro-nutrients as well as essential vitamins and minerals. In comparison to a soft drink that is made up of empty calories and large amounts of refined sugar, usually high-fructose corn syrup, a fruit or veggie will be a better choice. If you’re looking to cut back on sugar, however, cutting down on all foods and drinks that are sweet may be easier. Although an apple will provide your body with more than a can of Coke, your tongue and brain still react to the sugar in the same way. As the sugary treats continue, so does the addiction. Also remember that the amount of sugar in foods adds up quickly. Quick tip: 4 grams of sugar is equal to 1 teaspoon, and the body only allows about 2 teaspoons to circulate through the blood at a time. If cutting out sugar is daunting, consider evaluating the extras of a meal. Many times, dressings, sauces, and fat free items are loaded with sugar. By substituting those things with alternatives such as oil and vinegar, spice rubs, and quality fats, you will be doing yourself a favor. Also, try substituting cakes and cookies with things like berries and dark chocolate. Whatever you do, be sure to avoid fake sugars. Although they seem great because they are calorie free, the fact that they tend to be 600+ times as sweet as sugar causes confusion in the body. 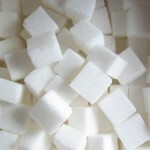 This super sweet chemical tends to cause the consumer to crave other super sweet foods in order to match the intensity. Do your body a favor and be alert to the volume of sugar you are ingesting. Then, make changes to eliminate empty sources and minimize other sources such as sweet fruits. If you are having trouble kicking the sugar addiction, our Nutrition Response Testing℠ technique can help you through the process. Contact us now to discuss further and setup your appointment!